'Leccy Tech If you've been waiting for the Chevy Volt or Toyota's as-yet unnamed offering before you buy a plug-in hybrid automobile, you'll need to sit tight until their planned 2010 releases. If you must have a plug-in right now, however, you'll need to move to China. That'd be the PRC, not Taiwan. Chinese carmaker BYD Auto began selling their F3DM plug-in hybrid this week. Retailing for 149,800 yuan (about £14,700 or $21,900 at today's exchange rates), the F3DM is the world's first mass-produced plug-in. But what exactly is a plug-in hybrid automobile? One straightforward definition comes by way of those ageless automotive gurus Click and Clack, who explain that "gasoline-electric hybrids [such as the Toyota Prius] use electricity to supplement a gasoline engine, whereas...plug-in hybrids...use a gasoline engine to supplement electric power." Exactly from what type of battery the F3DM uses to supply that electric power, however, remains a wee bit vague. Some reports refer to the F3DM's "lithium-ion" batteries, while Matt Hardigree of Jalopnik - who has actually ridden in a BYD hybrid - says that BYD uses "ferrous (iron) oxide" battery technology. Although BYD (which, by the way, stands for "Build Your Dreams " - yes, in English) Auto's website isn't completely clear on whether the F3DM's batteries are lithium-ion or ferrous-oxide, the company does build ferrous-oxide batteries and less-than-humbly extols its own "masterpiece" Fe3 technology. We're siding with Hardigree. 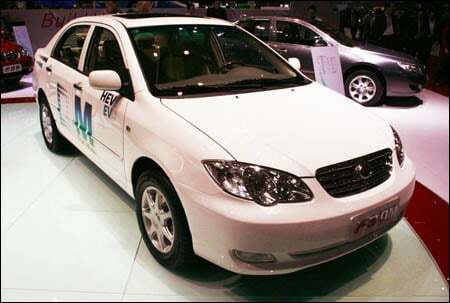 BYD Auto claims that the F3DM's range is 100km (about 62 miles) on electrical power alone. If you need to travel further, you can kick in the 1.0 liter gas engine to recharge the batteries. Or you can stop at a "special charge station" and stretch your legs for 10 minutes while the batteries are pumped back up to 50 per cent of their total capacity. It goes without saying that the current number of "special charge stations" hovers around zero, so you'll want to drive home for a non-gasoline-assisted recharging session. BYU Auto says that a full recharging takes about seven hours. The F3DM charges at 220 volts. There's no word yet from BYU Auto whether a 120-volt version will be available when the company begins shipping the F3DM to the US in 2010. (No UK plans have yet been announced). Also not yet known is what modifications, if any, that the F3DM will need to pass the relatively stringent US safety regulations - relative to those in China, that is - and whether any additional range-limiting weight gain will occur due to any needed safety upgrades. If the thought of a Chinese-made car being of high enough quality to sell like hotcakes is a bit of a stretch for your imagination, remember that Warren Buffett - he of the fabulously successful Berkshire Hathaway investment fund - bought a 9.9 per cent stake in BYD a mere three months ago. And Buffy didn't get rich by being wrong about such things.